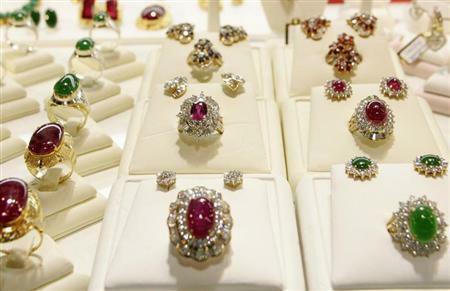 YANGON, Jan. 16 (Xinhua) -- An international gems and jewelry fair has opened in Myanmar's second largest city of Mandalay, the official Global New Light of Myanmar reported Wednesday. The international gems and jewelry fair-2019, which began on Tuesday and would end on Saturday, features about 400 booths and about 10,000 gem merchants from 40 countries and regions attended the event. The aim of the fair is to penetrate the international market through exhibition of Myanmar's gems, to rebuild international gem market in the country and to upgrade development of jade and refined gems market and technology. Chief Minister of Mandalay region Dr. Zaw Myint Maung said at the opening ceremony that there are various types of gems found in Myanmar and 80 types of precious stones discovered in Mogok, Mandalay region, adding that both high and low quality gems are displayed at the expo. Meanwhile, Mandalay city is scheduled to hold another international expo and business forum in the first week of March to attract foreign entrepreneurs to invest here. Products from Mandalay region and other places would be displayed at the forum.